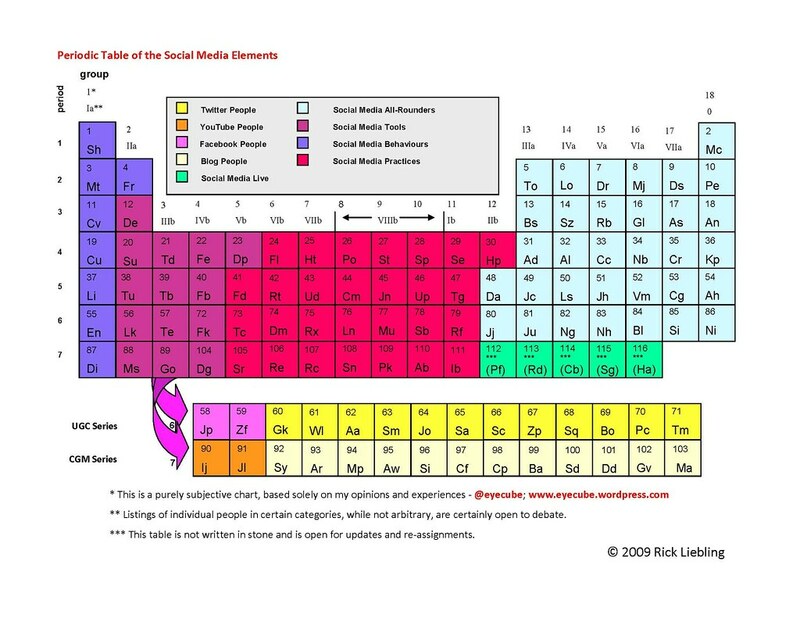 Rick Liebling put together a Periodic Table of Social Media Elements. This chart is interesting as much for the legend as the table itself. It's a road map to today's social media landscape with lists of influential bloggers, twitterers and experts; lists of terminology (we have all felt like we didn't know the secret handshake, this is so helpful); and a key to practices in social media (follow, hashtag, poke, status update). I especially like the behaviors--what do people do within the social media space? The idea is to mix up the different elements. 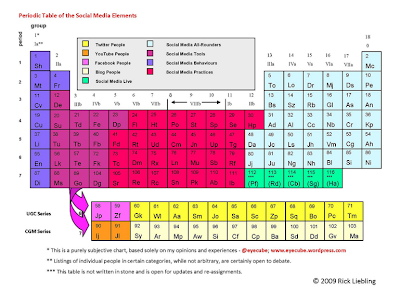 I am not sure how that works, but this chart/legend is a great primer for people learning about social media and a great checklist for people who want to fill gaps in their social medial strategy. Kurt Cagle writes on OpenCongress.org, a project of the Sunlight Foundation and Participatory Politics Foundation. 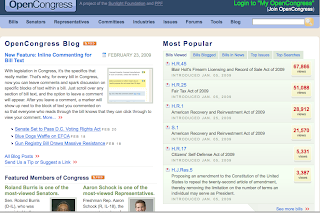 OpenCongress.org brings many of the tools of social networks - blogging, comments, syndication, interest rankings, tagging, and so forth - to the process of actually creating the laws themselves. For instance, the web designers of OpenCongress.org used one particularly innovative extension of commenting systems to make it possible to post bills that had come out of committee, and to allow people to comment not just on the bill overall, but even on specific provisions within those bills. It is perhaps debatable whether the comments themselves make that much of a difference - though I did read a couple that made me see some sense in an alternative viewpoint - but the very fact that the commentary exists in the first place means that people are reading the bills, and beginning to understand a process that, for the most part, has usually been something that took place in the background. [emphasis mine] -- Read more at O'Reilly. Although the OpenCongress site is not in dot-gov, it is definitely about dot-gov and really packs alot of citizen participation in one space. People can easily find a bill, see what is popular (by views, blogged, press coverage and search terms! ), and provide feedback. The site includes an A to Z issue index and a list of Congressional Committees and their relationships with links to additional committee information--like who is on the committee and what they are doing. Yes, much of this information is available on House and Senate sites, but OpenCongress.org provides the relationships and context outside of the individual member or committee structure. You can even rate your Senator or Representative. Now that is interaction that you are not likely to see on an "official" Congressional site. Why? It's hard for a site owner to be critical of themselves or to open themselves up for criticism (or insult). Every week there is an agency conversation that ends with, "Well, we can't take comments because someone might say something bad." We are just starting to see agencies taking this risk, like the TSA Checkpoint Blog*. I think that the features on OpenCongress.org deserve a close look. There is much that government could model to invite participation and increase transparency--from the friendly interface that puts participation front and center to the variety of intuitive ways to get to the information you want to the ability to subscribe for updates in different ways. Several of the President's "key White House staff," according to a press release from Robert Gibbs, will manage large portfolios for Internet outreach and "citizen participation" online. The list includes several veterans of Obama's presidential campaign, naturally, a former web adviser to Speaker Nancy Pelosi, and a former Google staffer who worked on the company's Moderator platform. --More from The Nation. The new White House team is taking a holistic view of New Media. Basically the line is between traditional media--print and broadcast--and new media--communications using the Internet from email to websites to social media. Macon Phillips, Director of New Media--since the election, he has served as Director of New Media for the Presidential Transition Team, developing Change.gov and overseeing the transition's overall online communications. Prior to that, he served as the Deputy Director of New Media for Obama for America, managing the day to day operations of the campaign's online program. Cammie Croft, Deputy New Media Director--comes to the White House from the Obama-Biden Transition Project, where she served as the Deputy New Media Director, specializing in online communications. Prior to that, as the New Media Rapid Response Manager for the Obama for America campaign, she oversaw efforts to integrate new media and communications. Jason Djang, Deputy Director for Video--served on the New Media video teams for both Obama for America and the Obama-Biden Transition Project as an editor and producer. Jesse Lee, Online Programs Director--worked in the New Media department for the Transition team doing online outreach, having done online communications for the Democratic National Committee during election season and the blog for Speaker Pelosi. Katie Stanton, Director of Citizen Participation--coming from Google where she was a Principal in the New Business Development team responsible for OpenSocial, Google Moderator, and various election-related initiatives. More details on the new team at whitehouse.gov. Transparency in government is like mom and apple-pie. Who doesn't think it's good? In the summer of 1974, when I was a really little girl, I watched the Watergate hearings. 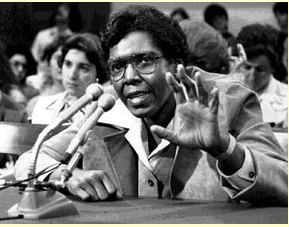 The seeds of my move to D.C., were planted by the incredible Barbara Jordan (D-TX). I was transfixed by the unraveling of the first "Gate" scandal. And was grateful for the efforts of the Committee, the Congress and especially the witnesses to make our government more transparent. Dan Munz, in his blog post on transparency, correctly identifies transparency as a "procedural virtue." Transparency, in and of itself, doesn't make government any better. So, how does more and more data showered on the American public make good policy? Dan suggests that making reams of data available allows those so inclined to customize information. This customization could make the info relevant to the actual lives of people, therefore improving public engagement. I think that there is something to this. People want to know how the ga-zillions of recovery dollars are going to help their personal recoveries--whether in their own pocketbooks or within their towns, counties, states or industries. Numbers as high as a ga-zillion are too big for people to grasp. The data could be mashed up and localized to help people understand what government is doing and to provide context so citizens can meaningfully advocate on decisions that affect them directly. Ultimately, the questions that people care about are ones like, Can I keep my house? What happens if I lose my job and health insurance? How do I get on the project to build the new bridge? The questions are very personal. The data is very general. Can the data be brought to a level that will make sense for individuals? Dan's other reason for transparency is accountability. He is right again when he says that accountability is only meaningful when "government is willing to listen to what people say once they have the facts." Here again, the showers of data have no value unless they are shaped in a way that make them meaningful. The goal of transparency is not transparency. Transparency efforts need to be measured by their effectiveness in facilitating accountability and citizen engagement. Read Dan Munz's post "Where's The Data." Transparency continues to be among top topics--i.e. the launch of www.recovery.gov and the requirements to make information on spending an effectiveness available to all. But as I discussed before, transparency is not just about open APIs and mashups. Enter Lisa Welchman, one of my favorite thinkers on web governance. Most recently US government Web growth is being made under the guise of “transparency” as communications-focused US government Web managers cling to easy-to-implement Web 2.0 technologies. I’m all for open communication and the transparency of government, but making new Web sites or layering bloated, poorly organized sites with a new face of Web 2.0 isn’t meeting the mission. Citizens and businesses need clear, easy access to information and services from governmental organizations on the Web. That must be the priority. Of course, it’s easier to start up a new venture then to police and correct an overburdened, poorly-managed large Web site. I understand the temptation to flee to the brave new world of Web 2.0 and abandon or ignore the low quality Web 1.0 sites. But that’s the easy way out, and the way that leaves citizens and businesses short-changed. There is a lot of valuable information on those sites. There is Information that citizens need in order to make decisions related to their family's health and education, and information that businesses need to operate legally. Transparency includes providing easy access to these deep repositories of information as well as the more interactive capabilities of the currently popular Web 2.0 technologies. [emphasis mine]-- Read the whole post here. Tech President does a good first run at the new content-filled incarnation of www.recovery.gov site (as compared to the placeholder previewed last month). Tech President outlines, at first blush, what is there--an "elegant" timeline, "cute" charts, invitation to share stories--and what's missing--primarily "data. data. data." Very soon, the different agencies...will decide who will receive award grants and contracts. Sometimes the money will go to a state government; other times, the funds will go directly to a school, hospital, contractor, or other organization. Agencies will then deliver that information to the Recovery.gov team. We will subsequently make the information available on Recovery.gov, and you will be able to track where the money is going.--Read it all here. This last part echoes the Collaboration Project Report on treating data as a national resource and making it available to all (see my last post). There is talk that the recovery.gov data application is being developed as an example of open, accessible data. This can be a model for websites with similar missions. It's definitely easier to have an open system if that's how it's designed, and it's not an insignificant task to retrofit a closed data system, but you have to start somewhere. This looks like somewhere. A national treasure is something that we all own, like the Grand Canyon or the Statue of Liberty. Government is steward of these treasures in order to preserve and make them available for all Americans for generations to come. So, too, should government treat data, as facilitators to making data available to all Americans. Ensuring data interoperability so that information flows seamlessly within and among agencies, and between government and citizens. Redefining the concept of authenticity to balance government’s role as an authoritative source with an environment that does not inherently distinguish “government data”. Recognizing the importance of knowledge management, and the potential of collaborative tools to revolutionize government’s ability to accrue institutional memory and withstand constant transition. The paper continues knocking down silos and walls. This time it's the silos that have agencies rewarded for owning data and keeping it in proprietary systems and the wall between "official government information" and the rest of the world. One of the more interesting aspects of this recommendation is turning the importance of government as a source on it's head. The authors assert that government information is no more reliable than other information. Thinking like this frees data and projects. It places dot-gov within the greater data and information ecosystem--with all the checks and balances, muss and muddle--of the crowd(s). The challenge behind this idea is how do we square it with laws and regulations that state that government IS different? That there are different standards of privacy, accessibility, notice, record keeping, etc., in the federal space? Some of us have been in meetings discussing the challenges of mixing government and private rules and mores--from the fraught discussions of access to 3rd party applications using persistent cookies to questions about whether comments on an agency Facebook page is a government record. You get up in the middle of the night and go to the kitchen for a glass of water. You reach for the light switch and, there, the light is on. You don't think about the light or the electricity. You go about your business, quenching your thirst. You pay for the utility, and it's there. The first recommendation from the Collaboration Project report, “Enabling Collaboration: Three Priorities for New Administration.” is to create an open IT environment in government. Currently, individual agencies are responsible for maintaining physical IT assets, placing the burdens of cost and maintenance on government and doing so in a way that is fragmented and strategically unmanageable. At a time when limitless bandwidth, disk space, and computing power have allowed most large organizations to do more with less, government continues to maintain individual ownership and management of its assets. While many organizations have integrated applications around a shared services model, government manages applications and data inline with organization hierarchies and silos. This model is quickly becoming unsustainable, in terms of both cost and a lack of scalability. ...Today, the ability to purchase and consume IT infrastructure as a utility reshapes this entire conversation. Instead of talking about integrating the various IT architectures of agencies and departments across government, it enables government to own and maintain a single, centralized physical center of computing power, and take advantage of applications that scale across the Federal environment as needed. --Read the entire report. What if a program manager had the ability to tap into an open IT system, like dialing a phone? Need a database? Dial. Need a server? Turn on the faucet. Need to do some statistical analysis? Drag and drop to create a report. IT enables work, rather than adding huge overhead to getting something done. This really requires an entirely--and I mean entirely--new approach to IT in government. 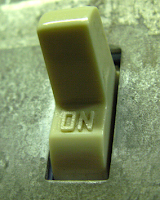 After decades building dedicated data centers, creating multiple "one stop shops," developing projects by the appropriations process, and expanding IT budgets/shops the idea that you can turn IT on or off--and that it would be accessible to anyone in government--is remarkable. And very exciting. The paper outlines myriad rules governing dot-gov that need to be addressed in making IT open in Appendix B.
Additionally, I would like to add that government will be challenged in loosing IT from government-created and -managed physical infrastructures by a requisite shift in responsibility to non-technical program managers. This means building competencies in understanding and using IT and creating modular, smart systems that can be easily accessed by non-technical staff. Overall, though, the idea of not spending redundant dollars on redundant projects that are outdated before they come online seems like a good recommendation. Quenches my thirst. This is a smart and juicy paper that bears more than one post. Let's start off with the indictment, or, three challenges that "currently inhibit the creation of a truly collaborative government" (Emphasis below added by me). An Outdated, 20th Century Technology Approach—Today, the most effective modes of information sharing and problem-solving are driven by a flatter, more collaborative organization. To power this organization, the world has moved towards acquiring information technology (IT) as a service, with flexible and adaptable applications and operating models. Today, IT is no longer the “hardened” part of an organization – its main purpose is instead to enable flexibility in the organization. The technical capabilities of the federal government, however, were and remain designed to meet the needs of a structure that is almost entirely hierarchical. Individual agencies continue to own and maintain their own rigid IT environment, complete with hundreds or thousands of unique applications and dedicated infrastructure—along with the burdens of cost, maintenance, and inefficiency that come with it. This model is unsustainable, distracts from the core missions of government, and inhibits collaboration. An Inability to Relate Data to Information, and Information to Decision Making—Throughout the 20th century, advances in communications enabled us to collect massive amounts of data from a diverse range of sources with unprecedented speed. The challenge posed for managers today is turning that raw data into information, and ensuring that this information informs decision-making. Unfortunately, problems in data interoperability, authenticity and knowledge management prevent government from engaging in this kind of empirical, data-driven decision-making, particularly as it relates to problems that involve multiple offices, agencies, or departments. A Culture that Inhibits Collaboration—Organizations that successfully collaborate provide organizational and structural incentives for innovation through the adoption and continued use of information sharing environments. Today, government lacks these incentives. Bureaucracy is designed to maintain the status quo, and there are strong institutional incentives to value stability over innovation. Moreover, bureaucratic hierarchy, reinforced by outdated policies and laws, artificially separates technology leadership from agency mission performance. So, we have a government with hundreds (or hundreds of thousands) of applications that don't talk to each other run by people who don't talk to each other. Definitely sounds like there is room for improvement. We'll take a look at the recommendations this week. What do you think? Facebook posted some data on it's users. Facebook US Audience Growth by Age and Gender. Facebook’s US audience has continued to grow in recent months, fueled by expansion primarily in users 26 and older. Facebook has been growing particularly rapidly amongst people over 45 in the US, as the charts show below: over 165% amongst both men and women 45-54 over the last 4 months. While the fastest growing age group by total users is still 26-34, the number of women over 55 on Facebook grew by an astounding 175.3% since the end of September. Their male counterparts, however, weren’t able to keep up - growing by only 137.8%. The number of women over 55 on Facebook almost double the number of men over 55 on Facebook today. Read more on the Facebook blog. And who says that FB is just for kids? Of the nearly 45.3 million active U.S. users in the last 30 days, 45% are 26 years old or older. One of the critical jobs for dotgov is to engage with citizens and other users where they are. Data says that FB is not a niche anymore. One of the first documents our new President signed within his first day in office is this memorandum on Transparency and Open Government...For the last couple of months I have been a member of the Technology, Innovation & Government Reform (TIGR) transition policy group focusing on innovation and government. This Presidential memo covers precisely the area that we worked on. Making information available is absolutely necessary, but not sufficient. There is so much data that it is often hard to find, let alone make sense of it. We need new ways to help us better analyze and understand what is behind all that information. For example, one of the most innovative IT concepts that has emerged in the last few years is that of mashups. A mashup is a simple applications that that can be quickly developed and put into operation. The applications are typically written using a variety of open, web-based tools and combine data from different sources using open interfaces. 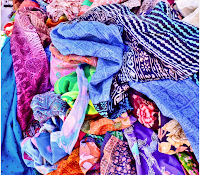 The biggest appeal of mashups is that rather than having to carefully pre-plan how data will be used and delivered, you can simply make that data available in industry standard formats and then encourage the public to apply their own innovative ideas to extract insights that the original data owners had no idea were there. These are the kinds of technology-based innovations that will take openness and transparency to a whole new level. More from The TIGR Group and the Gov. This helps us build an idea of upcoming policies from this Administration. Still, the biggest problem facing most agencies isn't the trap of outdated regulations but the failure to attract an audience. Take the Commerce Department, which spent months negotiating a special end-user license agreement with YouTube and became one of the first federal agencies on the site last year. It was an achievement for the department to make it to YouTube, but its videos haven't taken off: Its channel has 14 videos and three subscribers. Its most popular? A seven-minute clip of then-Secretary Carlos Gutierrez speaking to the Manufacturing Council in July, with just over 100 hits....Content experts suggest Commerce instead post how-to videos to help Americans apply for government loans or learn about helpful programs. Not every agency should expect to attract sizable audiences, given the specialization of most government offices, but that's not necessarily a bad thing, says Micah Sifry, co-founder of the Personal Democracy Forum and the blog TechPresident. Once again, a pitch for having a strategy. Being there is not enough. The correct question is not, "What can you provide?" but instead, "What does your audience want?" We have 113 days left to get to transparency, participation and collaboration. People are already referencing and re-using the language in the President's memo on "Transparency and Open Government." Today, I read a draft paper that was all about "utilizing Web 2.0 and social media" in achieving the goals of the President's memo. I came upon an acronym that I didn't understand (again! ), and it hit me like a 25 mph wind coming across the quad on a -13 degree day in Ann Arbor. How transparent can something be if you can't understand it? So what if the content is structured? So what if it's in a feed? So what if you can mash it up? So what if you post every piece of potential legislation 5 days before signing it? So what? If you can't understand it because it is written by bureaucrats and for bureaucrats in some wonky-tonky lingo that requires a secret handshake and a decoder ring, it just doesn't matter. It's like it isn't there. So, in addition to all the great techno-tools to help with participation and transparency, I would like to add the tried and true tool of clear writing. Specifically, Plain Language. No one technique defines plain language. Rather, plain language is defined by results—it is easy to read, understand, and use.--See more at plainlanguage.gov. For transparency to succeed--or, in other words, for government to make sense to citizens--we need to start with the basics. I can't participate in the debate unless I understand the choices. Adding the call to using plain language--not legalese, governmentese, technicalese or gobbledygook--needs to be integrated into each step of the transparency process. See some great before and after examples of plain language applied. One of the barriers to using social media is cultural/corporate. This means that decision makers and leaders may not share the zeal of the advocates. They may think that social media tools are used by a small niche of people, so why take the risk and adopt these crazy channels? Consumers are using a wider variety of channels than ever before. Newer channels, such as blogs and social networking sites, are gaining more and more traction. The survey found that 26% of consumers use social networking sites, compared to 17% in 2006. The usage of blogs nearly doubled (24% in 2008 compared to 13% in 2006). This is especially true among influential consumers – the 10% to 15% of the population who initiate change in their communities – of which 43% read blogs by nonjournalists (compared to 16% of the general population) and 32% read blogs written by journalists (8% of the general population). Conversely, the use of more established media channels continues to wane. The survey revealed that 65% of consumers use major network television news as a source of information (down from 71% in 2006). 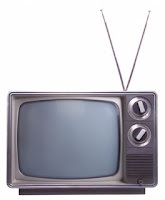 Local television news saw a sharper drop – 62% in 2008 compared to 74% in 2006. [Emphasis added by me]--From Media in the 21st Century. Read more. So, traditional network news use is decreasing and the use of social media is increasing. While the overall numbers are still in favor of traditional media, the trends look like the balance will shift. While this study was for traditional PR, we all know that a major focus of the government is to communicate--from peanut butter recalls to hurricane evacuation orders, from prescription drug benefits changes to the demise of analog TV signals, from immigration reform pros and cons to bank bailout pros and cons. 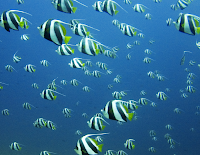 Adding additional channels to your communications strategy is just plain good business. For government, that is. More, including tables with media usage numbers, here.